Meridian Place is adding a new 10,000 square foot office building anchored by Latino Community Credit Union and a new orthodontics practice. 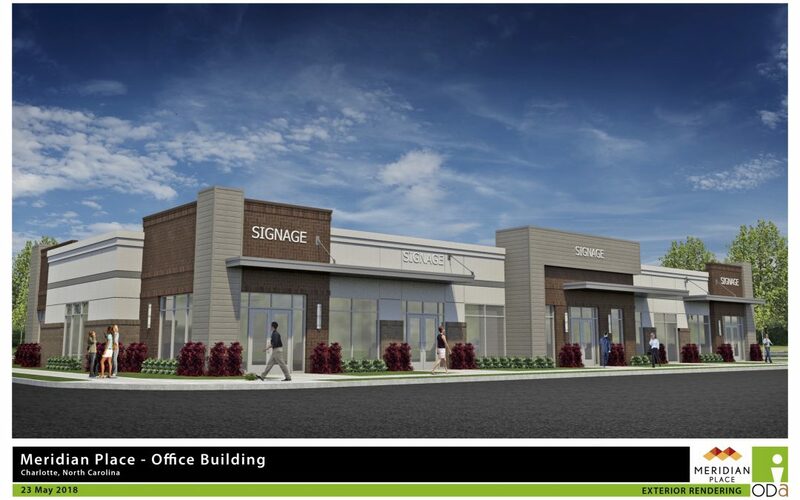 The credit union and orthodontics practice will join a recently opened Sprint telecommunications store and an expanding restaurant and retail group including Hawthorne’s NY Pizza, Wingstop, and McDonald’s in addition to the community’s M Station apartments. “This is another great milestone for Meridian Place as we add our first offices, a credit union and orthodontics practice,” said developer Roy Goode. “We are thrilled with all that is happening both at Meridian Place and in the MoRA area,” added Goode. The credit union will occupy 4,000 square feet of the new single-story office building while the orthodontics office will take 2,400 square feet in the building to be completed next spring. Additionally, Meridian Place and Childress Klein are marketing a three-story office building that will provide another 30,000 square feet of offices. Each of the office buildings is designed by Overcash Demmitt Architects. Matt Funderburk of OnSite Real Estate Advisors and Bob Vande Weghe of Evergreen Commercial Properties, respectively, represented the credit union and orthodontics practices in their leases while Susan Clements and Scott Wilson of Childress Klein represented the landlord. Developed in response to the changing needs of the MoRA area including the extension of the Independence Boulevard Expressway, Meridian Place spans more than a half mile of frontage on Monroe Road between Idlewild Road and Conference Drive. Meridian Place has worked closely with the MoRA community association on several projects including creation of the Embrace public art sculpture and gathering place near the intersection of Monroe Road and Conference Drive as well as a popular concert series launched this past summer. Enthusiasm and confidence in the area has led to numerous other new projects in the Monroe Road corridor ranging from MoRA Point, a major commercial development just to the north of Meridian Place, to expanded retail and commercial in the Oakhurst area and Crowne Point including a recently opened Famous Toastery.